The press release from Jolie360 about the Knysna Craft Beer Project! 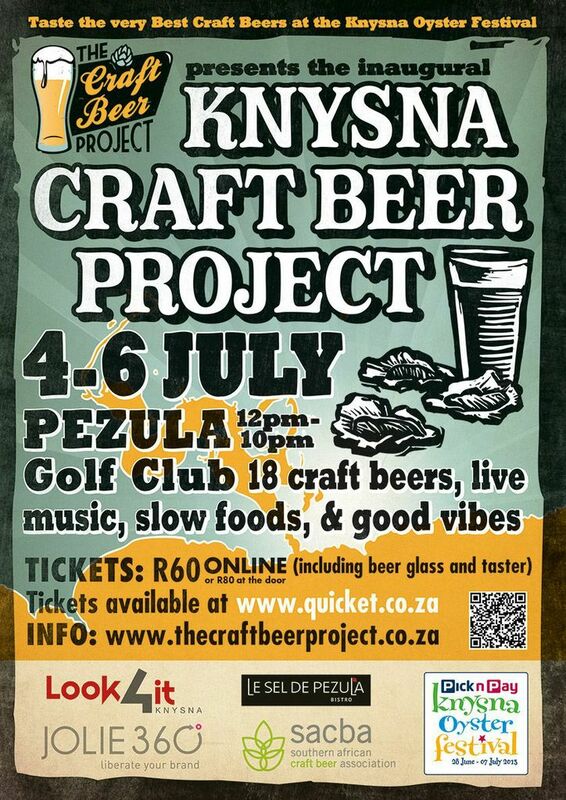 The Knysna Craft Beer Project 4th till 6th July 12pm to 10pm at Pazula Golf Estate, is the latest and exciting venture of The Craft Beer Project. Working closely with The Pick n Pay Knysna Oyster Festival, The Knysna Craft Beer Project will present the very best Craft Beer and Ciders by Brewers for all festival and craft beer enthusiasts to enjoy. 18 Taps of local and national brewer’s beers and ciders will be available to taste, drink and enjoy. Along with this, a range of delicious slow foods will be available to complement each beer and cider. Pezula Golf Estate provides the idyllic setting as enthusiasts can sip and savour craft beers whilst listening to live music in the warmth of the Golf Club. The festival will maintain an intimate and friendly atmosphere that will allow interaction with The Craft Beer Project team about the brewing process and tasting regimes of brands on offer. Some brewers to look out for are Boston Breweries, Belgian Beer Company, Shongweni Brewery, Everson’s Cider and more! The Craft Beer Project looks forward to yet again uniting the craft beer family leading the craft beer Revolution in South Africa “We are all about drinking, enjoying and educating people about great beer” Tickets are available for purchase online at http://www.Quicket.co.za for R60 or R80 at the door, both of which include a glass and taster.